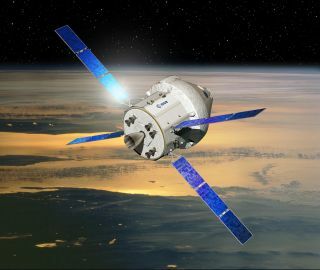 Artist's concept of NASA's Orion crew capsule with a service module provided by the European Space Agency. LONDON — The European Space Agency has some ambitious resolutions for the New Year. The year 2013 will include the agency’s first spaceflight for its newest class of astronauts, the launch of its latest robot cargo ship Albert Einstein, and the development of new rockets and spacecraft, including a reusable space plane and work on NASA’s new Orion capsule. ESA will provide one service module for Orion’s 2017 test launch. The module’s preliminary design review, or PDR, is planned for July 2013. The PDR is a major milestone for spaceflight projects, allowing managers to check a spacecraft's design progress. An artist’s illustration of Europe’s planned Ariane 5ME and Ariane 6 rockets. The Ariane 5ME (left), if approved, will fly later this decade, while Ariane 6 (right) may operate alongside Ariane 5ME in the early 2020s. This is one concept for the European Space Agency's new Ariane 6 rocket, which would be operational in the 2020s. European Space Agency astronaut Luca Parmitano of Italy during Soyuz training in Star City, Russia. The ISV would be Europe's civilian equivalent of the U.S. Air Force's unmanned X-37B Orbital Test Vehicle, a robotic miniature space shuttle that has flown on three missions since 2010. The unmanned European space plane would be much smaller than the Air Force vehicle, however.